Java Archive (JAR) is a cross-platform archive file format used to compress and bundle multiple files (e.g. Java class files), metadata and resources into a single file with the .jar file extension. It is the preferred way for packaging Java applets or applications into a single archive, so that they may be downloaded by a browser with only a single request and response. JAR files are built on the ZIP file format algorithm and are similar to UNIX’s tape archive format (TAR) and can be signed using digital signature to ensure authenticity. Users can create or extract JAR files using the jar command that comes with a Java Development Kit (JDK). They can also use zip tools to do so; however when compressing, it’s important to note that the MANIFEST must first within the ZIP file order entries. c - Creates a new archive. f - Specifies the JAR file to be created. In the above example all the class files in the present directory will be bundled into the file called Name.jar file. The above example would bundle all the class files in the present directory and the all the contents in the subdirectory SubDirectory into a JAR file name Name.jar. The manifest file, META-INF/MANIFEST.MF, is automatically generated by the jar tool and is always the first entry in the JAR file. The manifest file has meta-information about the archive is stored as name: value pairs. The jarsigner utility within the JDK can sign and verify JAR files. 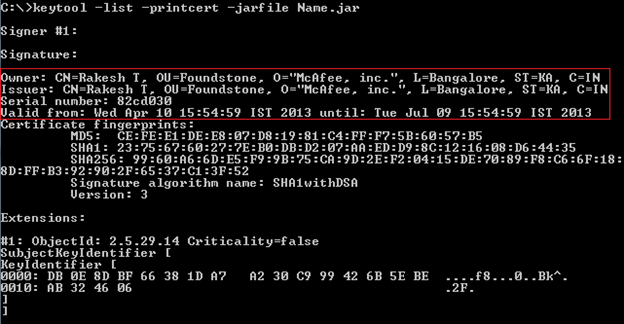 JAR files are signed using PKI (Public Key Infrastructure). PKI uses a public and private key pair - the private key should be kept with the owner privately and securely and the public key can made available publicly. Here the private is used to encrypt the file’s hash value and the public key will be used to decrypt the encrypted file’s hash value. 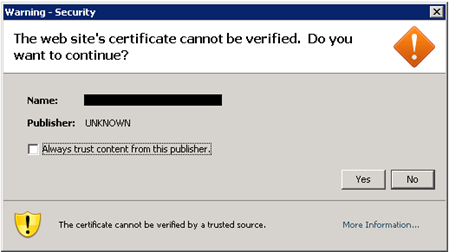 Also to make the certificate genuine it has to be in the known Certificate Authority (CA) Chain. (The whole discussion on CA is out of scope). 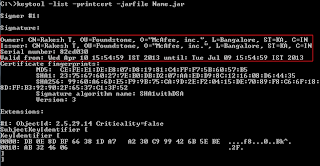 When you sign the JAR file, the certificate containing the public key is created in the META-INF directory. The digest (or hash) is computed for all files in the JAR and is also included in the manifest. A signature block file with extension ".DSA" (Digital Signature Algorithm) is also created in META-INF directory. This file includes the digital signature for the JAR file, the digital certificate and the public key of the signer. Note that if such files are located in META-INF subdirectories, they are not considered signature-related. Before we sign the JAR file, we need to create private and public file required for encrypting and decrypting the JAR hash or digest value. JDK provides the keytool utility for managing public/private keys and digital certificates. The jarsigner utility can be used for signing the JAR files. Following the above command you will be asked for the keystore password or to create one if the keystore does not yet exist and then, you will have to answer seven questions to record your identity. Then you will be asked to choose a password for the keys you just created. Now the key pair is generated which will be used to sign the JAR. Note: Including the passwords on the command line is usually a bad idea – if you leave out the values then jarsigner will prompt you for them. Download the JAR file and verify. You can extract the downloaded JAR file and manually parse the MANIFEST and .SF file data in the META-INF sub-directory. The above option will not give any certificate information like Owner, Issuer or validity. 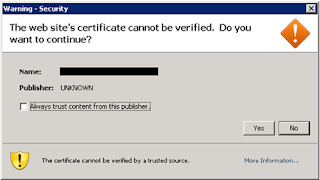 The above output would reveal the Owner, Issuer and Validity Information of the certificate. Signing the JAR with valid signature would help the users to identify malicious component publishers and modification of the components after publishing.